We are committed to providing a loving, happy environment that helps our children learn about the Christian faith by actively engaging them and their families in every aspect of the church community. We are committed to integrating our children into all aspects of our common life through intergenerational activities, by helping them participate in liturgy through the Server’s Guild and in reading, and through special events within the parish. Since every family is unique, we offer a range of programs and resources to support your family’s spiritual journey. Below you can learn more about our Sunday programs, youth group and yearly events. Lots of St. Martin’s families come early and enjoy some energy-burning chaos before the service. There are crafts, toys and games downstairs as well as outdoor sports in good weather. Volunteers are on site for parents who need a quiet moment to pray upstairs. This time is open to children, youth, parents and grandparents of all ages who are ready to play. 11:00 – 12:15 – Kids’ Church Live! At 11:00am we start our Kids’ Church with a short welcome activity and prayer before heading off to our age specific groups. There are no statistics to confirm this, but it is generally agreed that St. Martin’s has a higher-than-average number of high-energy kids. Fortunately we also have some seriously high-energy Kids’ Church leaders who specialize in active learning. This is open to children from infants to grade six. 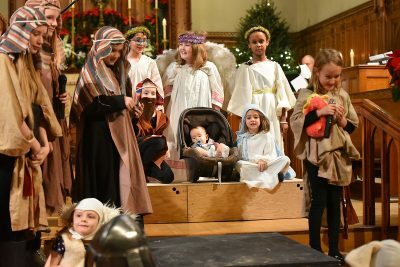 At 12:15 we conclude our Kids’ Church program with a song and prayer in the chapel and head upstairs to join parents and grandparents for the Eucharist. Baptised or confirmed children are encouraged to receive the bread and wine if their family wishes. Others receive a blessing instead. 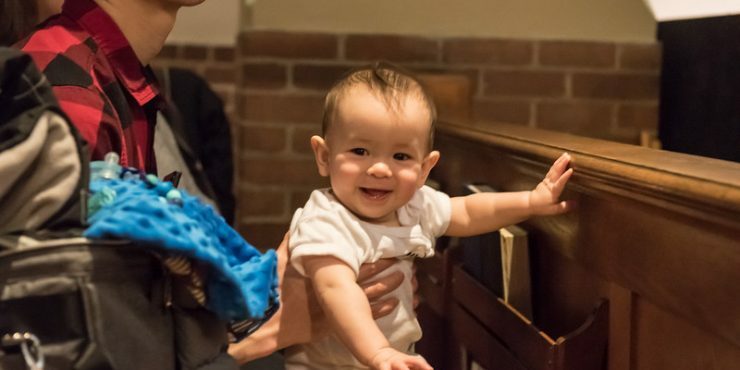 At St. Martin’s we realize that some children learn more at church when they stay with their parents and enjoy the service upstairs. It is just wonderful for children to sing, pray and learn about God along with us. To support the children who prefer to stay upstairs, there are two striped boxes full of books, activities and snacks at the back of the church. Feel free to take the whole box to your pew and use anything that makes the service more meaningful. If you find this a helpful way for your family to enjoy the service let us know and we will customize a pew box for your children. St. Martin’s teenagers are active members of the service on Sunday morning carrying crosses, helping in Kids’ Church and singing in the choir. Apart from Sunday, the youth group meets once a month to tackle the hard questions, learn about the bible and generally eat a lot of popcorn. Watch our Upcoming Events for meeting details. Throughout the year we have some awesome kid-focused programs that bring the story of Jesus to life for our children. These events are open to all ages. No experience is necessary! Watch the website for specific dates and times. Carolling in the Garden – a late afternoon campfire in December with s’mores and singing in the garden. Christmas Eve Children’s Pageant – This early evening service is designed for families with a short play of the Christmas story instead of a homily. 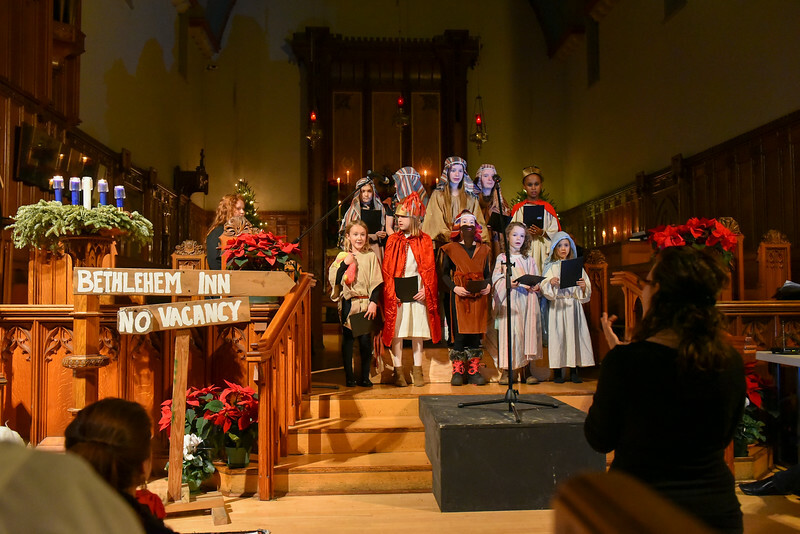 If your children are interested in acting please attend the Kids’ Church program for the first week in Advent to get your script. Good Friday – Join us Good Friday morning for a kid-style stages of the cross. Complete with costumes and roving minstrels, families move around the church learning about Jesus crucifixion and working together to complete tasks. Strawberry Tea – Our annual strawberry tea is a great opportunity to kids to run wild in style. After consuming unhealthy amounts of strawberries, biscuits and whipping cream, our kids have a croquet tournament and tree-climbing contest. Garden-party hats are welcome though not mandatory. September Dinner and Compline in the Garden – This event is regularly held the weekend after Labour Day as a chance to welcome everyone back from the summer and pray for our children and youth as they start school. Families are welcome to bring a salad or dessert to the barbecue and after dinner we join together for Compline – a 10 minute service inviting Christ to light our lives and guide us in the coming year.